I spent part of my summer teaching English to Burmese refugees at a local robot-uniform factor (yes, I did say “robot-uniform”! Who knew the intense need for such textiles?!?) They were a delightful bunch, and I loved every minute I spent with them – gleaning from their perseverance while imagining the sorrows they carry. 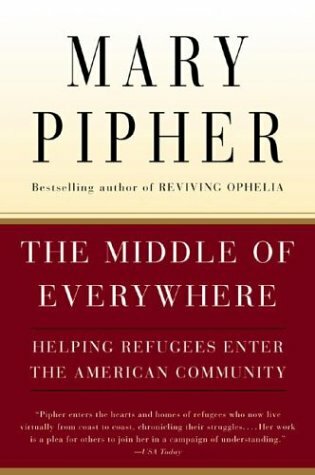 This experience spurred me to read Mary Pipher’s book The Middle of Everywhere: Helping refugees enter the American community. What I most loved about this book was Pipher’s premise for writing it. She lives in Lincoln, Nebraska, where immigration is a fairly new thing, and the city is still adjusting to its newly acquired diversity, or what she deems “cultural collision on the great plains”. She speaks of how identity can occur only in context, and suggests that as our world globalizes, we will all have identity issues like many of the displaced refugees with whom she has worked. “Who are we when we don’t have a hometown when we don’t know our neighbors or our kin? Who are we when we don’t know the history of our land or the names of common plants or birds in our area? Or when our stories come from television sets instead of grandparents or village storytellers? Who are we in a world where the universal language is, to quote Pico Iyer, ‘french fries’? It is with this foundation that she embarks upon the stories of the many refugee families with whom she has been friends. She writes especially about refugee stories of young people as well as looks at how generational differences affect families in cultural transition. Their stories are poignant, realistic, and raw. Pipher is skilled at giving refugees human faces – turning stigma into stories and facts into faces. She points to the need for ‘cultural brokers’ who will serve as refugees guides in a system that may be apt to exploit them because of their vulnerability. I’d highly recommend The Middle of Everywhere for anyone living near refugee communities who wants a deeper understanding of their new neighbors.